The election of Trump, the most corrupt administration in U.S. history, galvanized a historic resistance. The women’s and #MeToo movements, the Movement for Black Lives, the fight for immigrant justice, the environmental justice movements, the youth and student movements, and the increasingly militant organized labor movement have set millions into motion – at the polls, in the streets, on campuses and in union halls. In November 2018, a broad coalition – reflected in an unprecedented voter turnout – wrested control of the House of Representatives from the GOP’s right-wing corporate stranglehold. Hundreds of progressives were elected, shattering records for the number of women, people of color, LGBTQ, and union members in public office. Socialist-identified representatives now sit in Congress, state legislatures, and city councils. Their wins signal a shift toward a working-class and people’s agenda among many sectors of the population. white supremacy, misogyny, anti-Semitism, and anti-immigrant xenophobia, all in the interest of the most backward circles of the very rich. The threat of right-wing terrorism is escalating. Attempting to overcome capitalism’s deep crisis, the most backward section of the billionaire class is in attack mode: its agenda includes tax cuts for the super-rich, imposing “right to work” legislation, eliminating regulations, Medicare, Medicaid, food stamps, environmental protections and clean energy policies. To achieve these ends Trump’s unleashed an unprecedented attack on democracy and the press, threatening repression and violence against opponents. Whether it’s suppressing opposition at home, or saber rattling abroad, make no mistake: these attacks unless rebuffed carry with them a fascist danger. Since our founding, Communists have been leaders and participants in the struggles for democracy, jobs, equality, environmental protection, and peace. Unemployment insurance, Social Security, industrial unions, along with the defeat of fascism, McCarthyism, and Jim Crow racism were won with our active involvement. The Civil Rights revolution, the women’s movement, the anti-Vietnam War movement, and the rebuilding of the labor movement, were all influenced by the energy, analysis, ability to build broad unity, and working-class partisanship Communists bring to the fight. Interest in socialism is on the rise. Millions of young workers face a dead-end future of Uber and Amazon jobs, part-time work, and are drowning in student debt. They increasingly wonder if there’s a future with the rise of automation, big data and robotics. 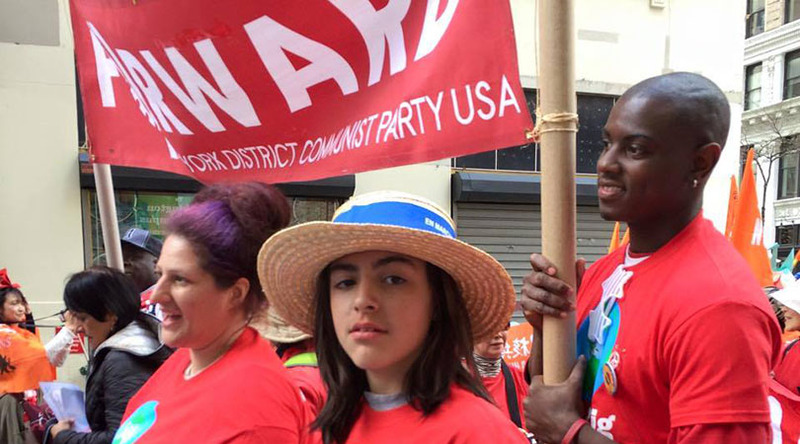 The CPUSA’s commitment to building the broadest unity to defeat the extreme right, to putting the science of Marxism in the hands of our working class, and our confidence in our nation’s socialist future is attracting a new generation of activists.